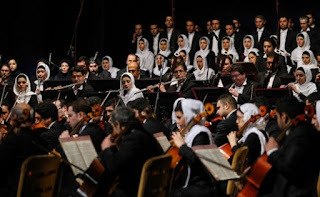 Islamic Regime in Iran: Women Can't Play Music on The Stage……. "We were preparing ourselves to play the national anthem before the opening of the world wrestling championship teams, we were just 15 minutes away and getting ready on stage, when they said women can't play on the stage and therefore called it off ." The games were scheduled to take place on 27 and 28 of November 2015 . It was reported that,since half of the musician were women and they had their Hijab , still the Ministry of Guidance and Culture called it off. IRAN WATCH CANADA : This is not acceptable at all . Islamic regime in Iran with these kinds of actions violating the basic human rights and with prejudice against women must not be negotiated in all kinds of trade unless to follow the human rights charters ratified by world in UN …. IRAN WATCH CANADA : Islamic Regime in Iran Won't Allow Iranian Women To Attend in Sports Stadiums And Support their National Sport Teams……..Isn't this like What ISIS or Taliban Do ??? (Lausanne, November 26, 2015) – The International Volleyball Federation (FIVB) can and should use its leverage with Iran to seek an end to the discriminatory ban on women and girls attending volleyball matches in Iran, Human Rights Watch said today after meeting with the FIVB in Lausanne. In October, the FIVB awarded Iran a February 2016 beach volleyball World Tour tournament, a first for the country. Iran will also host the June 2016 World League tournament—two opportunities to allow women to attend. The FIVB, in a statement to Human Rights Watch, affirmed its concern about the exclusion of women from stadiums, and said it is working to address this discrimination. However, the FIVB should escalate its efforts so that women can return to stadiums, Human Rights Watch said. Among other types of gender discrimination women face in Iran, they are barred from entering sport stadiums, including to watch men’s volleyball matches. In October, Human Rights Watch began a digital advocacy campaign, #Watch4Women, which seeks to end this ban and more broadly to strengthen respect for women’s rights in Iran, in line with international human rights standards and the Olympic Charter. Women were able to attend volleyball matches until 2012. The ban on women violates the “Fourth Fundamental Principle” – on nondiscrimination – of the FIVB’s own constitution, Human Rights Watch said. Request that Iranian police protect women who attend volleyball matches, instead of deploying them to arrest and drive off women, as has been the case in the past. Rebutting the FIVB’s claim that the #Watch4Women campaign is calling for a boycott of volleyball games in Iran, Human Rights Watch said that the objective is to end such blatant discrimination against women and girls, and that it is the Iranian authorities who are enforcing a “boycott” on female spectators. The ban is not just opposed by women’s rights activists, but also by many reformists in the country. By playing a key role in ending Iran’s discriminatory ban, the FIVB could follow the path of the International Olympic Committee (IOC), which adopted its reform “Olympic Agenda 2020” last December. A central pillar of the reforms is gender equality. The FIVB had a very productive meeting with Human Rights Watch this week, where the FIVB asked Human Rights Watch to work together to strive for gender equality in Iran since there is an issue of not only local women not being able to attend men’s volleyball matches but also men not being able to attend women’s volleyball matches. The FIVB has made significant progress working closely with local authorities in trying to improve the situation in Iran with families being able to attend volleyball matches a key aim and believes that with the help of Human Rights Watch, further headway can be made. The FIVB recently launched its 9 Goals project, which coincides with the IOC’s Agenda 2020 objectives, and a key part of the project is to make volleyball the No 1 family sport entertainment in the world. Allowing families to attend volleyball matches in Iran is an important component of this. "The FIVB can't lay claim to gender equality so long as they allow Iran to exclude women," Worden said. Human Rights Watch urged the FIVB to act swiftly, to secure a repeal of the ban ahead of the beach volleyball tournament in Iran, just weeks before International Women’s Day on March 8, and months before the Rio Olympics. The FIVB should say publicly —as has FIFA concerning football—that if Iranians want to host tournaments in 2017, they must repeal ban on women now, Human Rights Watch said. ILO ( Confederation Of International Labor Organizations) Made Its Complaint Against Islamic Regime in Iran ….. According to news released ,the confederation of International Labor Organization ( ILO ) made a complaint against Islamic regime in Iran for their systematic practice on Iranian labor organizations . This complaint is based on the complaint and reports from several Iranian labor organizations including the Iran Union of Transit Drivers …….. 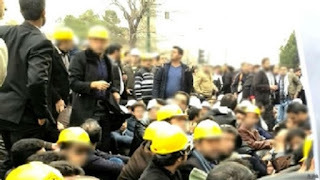 The complaints case number 2508 and 2807 are made public and its about repressive practices the Islamic regime follows against its labor which systematically violates their rights. For more info please go to ILO website…..
Said Mortazavi , a judge known as butcher of the reformists media , a judge who was involved in the killing of Zahra Kazemi the Iranian - Canadian photojournalist , as a person who was involve in the killings of Iranian protesters in green movement in Kahrizak prison, and as a person who's involvement in corruption of billions of Iranian money ..left Iran for Najaf city in Iraq. How can he travel outside of Iran with huge criminal records while the Iranian human rights defenders like Nasrin Sotoudeh or Narges Mohammadi and other human rights defenders can't leave the country .????? His departure from Iran raised the eyebrow of many politicians and human rights defenders who follow the politics in Iran closely and opens many questions ? Question like , why did he leave Iran? Was there a possibility to arrest him for his involvement in Zanjani's huge corruption charges ( Zanjani is on trial currently in Iran ) ???? Was his life in danger ? for example the Sepah intelligence to kill him due to lots of information he has about the Spah's involvement in corruptions. Is he going to be killed in Iraq silently ? As what happened to Said Emami an agent of ministry of information !!!???? Or will he return to Iran …?????!!! There are so many questions about this well informed and controversial former judge and a strong supporter of fundamentalists and Ahmadi Nejad's Government. According to reports in social networkings, the political prisoners in Rejaei Shahr prison were assaulted with knives by other prisoners and some of the political prisoners including Said Madani and Said Razavi Faghih both well know political prisoners and supporters of green movement were wounded in this assaults. There has been always outcry that the lives of Iranian political prisoners are in danger when the judiciary or the prison officials transfers the political prisoners and mix them with criminal prisoners and this of course is a kind of policy which regime follows to punish or to silence the political prisoners . In protest, the political prisoners including ; Said Madani, Said Razavi Faghih , Jafar Eghdami, Behzad Arabgol and Kamran Ayazi went on hunger strike and demanded two of those prisoners be transferred from their wards . Turkey's Government and their collaboration with ISIS ……. According to news the prosecutor in Turkey arrested the editor of the " Jomhouriat" newspaper . 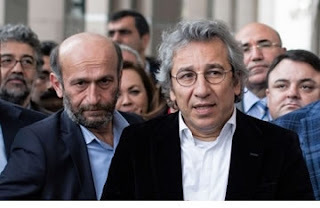 The editor and another journalist who works for the same newspaper were arrest on Thursday by apparently a complaint from Tayyip Erdogan the president of Turkey. But the reality is that , early this year both this journalists disclosed news and video about a load of packages on the border of Turkey and Syria which was headed for ISIS and the packages were including guns and ammunitions in medical packages. The Government arrested these journalist for disclosing this parcels which was banned for publication. Journalism isn't a crime ! Don't Shoot the messengers !
" Sepah " Has Threatened More Journalists Will Be Arrested …………. 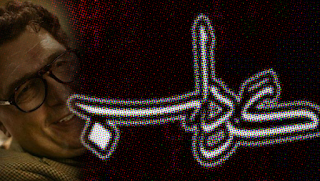 According to Sepah's website ( Sepah= the Revolutionary Guards ) known as Gerdab , Alireza Rahmani the spokesperson for the Sepah's commanding office on cyber security said; Surely those other journalists working with newspapers inside the country and are in collaboration with Behnoud ( A pro- reform Iranian Journalist who is currently working for BBC -farsi programs and living in England)will be dealt with when their turn comes up. 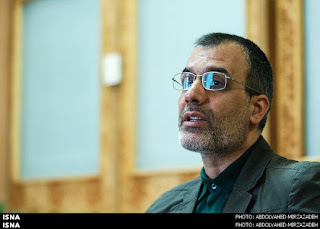 The Intelligence of Sepah ( the revolutionary guard ) is carrying an underground assault on all journalists in media or civil rights activists and others who are critical to the regime before the coming of parliamentary and assembly of experts election in next March. Their main targets are the pro -reformists and particularly those who have actively participated during green movement. Masoud Behnoud a well known journalist is known for his active support for reform and reformists government and green movement . Behnoud currently live in London and works with BBC Farsi programs. According to News: A Person Who Was Receiving Oil From The Ministry Of Oil To Sell , Took 160 Billion Tumans Of Iranian Government Money And Escaped To Canada …..!!!?????? According to Mr. Naser Saraj the head of the inspection Organization of the Country , a man like Babak Zanjani ( Who is currently in trial for money laundering & corruption ) who was receiving oil from the ministry of oil to sell , took 160 billion Tumans ( Iranian money ) and escaped the country for Canada . Mr. Saraj who was in Pakistan speaking to IRNA reporter on Wednesday said, most of the money launderers and corrupted people in the country have escaped to Canada . Mr. Saraj did not mention or disclose the name of the person but he said , we will try to return the money to the country. He add by saying that, when someone like this escape to a country , we can't do anything but hope that the destination country will cooperate with us and return the person back to the country. The Saudi Arabia-led coalition used a British-made cruise missile to destroy a Yemeni ceramics factory, a civilian object, on 23 September, 2015, Amnesty International and Human Rights Watch said today, based on field research and interviews with eyewitnesses at the scene. The attack on the factory in the Sana’a governorate, which appeared to be producing only civilian goods, killed one person, and was in apparent violation of international humanitarian law (IHL), the laws of war. This strike, using a British missile supplied in the 1990s, undermines the claim of Ministers that the Saudi Arabia-led coalition’s use of UK military equipment is consistent with IHL, and that the UK monitors such compliance “very carefully”. The organizations are unaware of any credible coalition investigation into this or other apparently unlawful airstrikes for possible IHL violations. Amnesty International and Human Rights Watch have examined the weapon remnants at the 23 September strike site and identified the munition used as a PGM-500 ‘Hakim’ air-launched cruise missile, supplied in the mid-1990s and manufactured by the UK firm Marconi Dynamics. The analysis compared fragments photographed at the strike site with unexploded remnants of the same missile type from a separate strike and found both were consistent with the deployment of an air-launched PGM-500 ‘Hakim’. The other recorded strike using this type of cruise missile hit an open field on 4 or 5 November in Sahar in Sa’da governorate in northern Yemen and did not result in any known casualties. Amnesty International staff visited the Sana’a strike site on 6 November and they, as well as Human Rights Watch, later interviewed one of the factory owners and other witnesses to the strike. The airstrike took place between 11 and 11:30 a.m. on 23 September in the village of Matna in Beni Matar district, west of Sana’a. Witnesses and one of the factory owners said that four missiles hit the Radfan Ceramics Factory in quick succession. He later returned to the factory, which had smoke rising from it and was in ruins, particularly the section with heavy machines used to heat and press the ceramics, which was entirely destroyed. One man in the vicinity, Yahya Abd al-Karim al-Sawary, 28, was killed by shrapnel as he was fleeing the area. A local resident who asked to remain anonymous told Human Rights Watch that the victim had been working as a guard at a makeshift detention facility run by Ansarullah, the political wing of the Huthis, a Zaidi Shi’a armed group in northern Yemen. The site had originally been a government building known as the Productive Families Centre, approximately 140 metres from the factory compound. The airstrikes did not hit the detention facility. Ali Ahmad al-Faqih, 55, who was injured in the attack, said that he had been on a motorbike trying to check on his family who live next to the factory during a brief lull between airstrikes – not realizing the attack had not finished: “I heard a whizz and knew it was a rocket coming,” he said. “I lay down and prayed out loud. I saw all my body covered in blood.” Al-Faqih was later taken to a private hospital, where he underwent surgery to remove shrapnel from his chest. Another local resident told Human Rights Watch that a second civilian, Elham Hussein Hussein Taher, a 14-year-old girl who lived near the factory, was also injured in the attack. 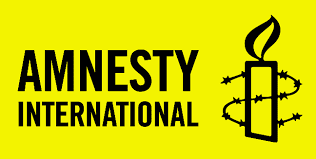 Ghalib Muhammad al-Sawary, one of the factory owners, told Amnesty International that the factory had never been used for any military purpose. Other witnesses told Human Rights Watch that no fighters or military vehicles were in or near the factory at the time of the attack. During its on-site investigation Amnesty International did not observe any evidence that would indicate that the factory had been used for a military purpose. The organization observed that the area directly surrounding the factory compound appeared to be residential and that it was next to the 26 September Hospital. The strikes on the factory caused minor damage to the hospital. Amnesty International visited the hospital on 6 November and observed the damage and spoke with staff who had been there during the strike. The owners of the ceramics factory, which opened in 1994, said that it was the only such facility in the country, and employed around 330 workers, primarily from the village of Matna. However, its owners said they were forced to stop operations in April this year due to security fears for its staff and difficulties obtaining fuel to operate machinery. IHL prohibits deliberate attacks on civilians not taking a direct part in hostilities and on civilian objects, and attacks that do not distinguish between civilians or civilian objects and combatants or military objectives, or that cause disproportionate harm to civilians or civilian objects in relation to the direct military advantage that may be anticipated. Such attacks are serious violations of IHL and if committed with criminal intent can constitute war crimes. All countries have legal responsibilities under international law to control the transfer of weapons and to restrict or prohibit their transfer in certain circumstances. The UK is a party to the Arms Trade Treaty (ATT), which came into force in late 2014, and played a leading role in its establishment. Under article 6 of the treaty, a country is prohibited from authorizing an arms transfer if it has knowledge at the time of authorization that the arms would be used in the commission of “attacks directed against civilian objects or civilians protected as such, or other war crimes as defined by international agreements to which it is a Party.” Further, article 7 of the ATT requires that states assess the potential that the arms being exported could be used to commit a serious violation of international human rights or humanitarian law; if there is an overriding risk of this, their export shall not be authorized. As it is now evident that there is such a risk, the UK and all other countries that supply arms to the members of the Saudi Arabia-led coalition should suspend all transfers of weapons that pose a substantial risk of being used in unlawful airstrikes in Yemen, particularly air-to-ground munitions, Amnesty International and Human Rights Watch said. 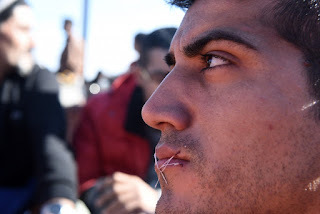 At least six Iranian refugees sewed their mouths shut at the Greek-Macedonian border to pressure authorities to let them pass into Macedonia on their way to western Europe, according to Reuters. The group of refugees had been at the border for four days, stranded after European officials tightened border policies in the wake of the deadly terror attacks in Paris, France. They are among hundreds of people from Iran, Morocco, Pakistan and Bangladesh who were barred entry after Slovenia and other European countries stated they would only grant access to people fleeing violence from Syria, Iraq, and Afghanistan. People from other countries were considered “economic migrants,” and therefore would not be allowed passage. Between Sunday and Monday, about 2,900 people crossed into Macedonia — down from 6,000 the previous day. Other refugees and asylum seekers have taken similar extreme measures to indicate that they cannot return to their countries of origin because of fear of death or persecution. Last February, for instance, more than a dozen people arriving on the Italian island of Lampedusa also sewed their mouths shut with fishing wire and a sewing needle, claiming that they were put in deplorable conditions in immigrant detention centers without any word on the progress of their asylum applications. And even here in the United States, people who don’t want to be removed back to their countries have risked their own lives to show that they can’t be sent back. One Bangladeshi immigrant told ThinkProgress that he had gone on a hunger strike because returning to Bangladesh where he’s a member of the opposition party could result in his imprisonment or even worse, death. “I knew if I go back, I’m going to lose my life so I decided with other detainees that if we die, we’ll die here without eating,” the former detainee said. UNHCR must help Iranian refugees to settle in a third country . Most of these Iranian refugees are political refugees but unable to present their case. Most of Iranian refugees falls in the political refugees categories and not the economic refugees………. Hossein Jaberi Ansari Foreign Affairs Spokesperson: Iran Is Against Misusing The Human Rights Issues Against Independent Countries ???!!! According to news from ISNA , Hossein Jaberi Ansari the spokesperson for the Islamic regime's foreign affairs said: Iran is against misusing/ Using Human Rights as a tool against independent countries. Mr. Jaberi Ansari was speaking about the recent third committee of the UN general assembly which issued a resolution against Islamic regime in Iran for continues violation of human rights particularly the high number of execution . 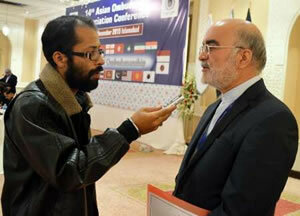 Mr. Jaberi Ansari said: Islamic Republic of Iran (???!!!) 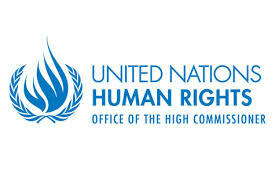 based on its principles is against misusing / using the human rights issues as a tool against independent countries. First of all, Islamic regime in Iran is not independent, because its economy and policies are influenced by capitalists norms and its economy depends on western industrial countries as well as China. secondly , Islamic Regime in Iran does not and can not introduce a modern policy or a modern country based on its Islamic ideology . It can not introduce a civil society based on its Islamic teachings . Because Its policy is based on 1400 years ago's Islamic principles / at the time of Mohammad the Islam's prophet . After the revolution in Iran, it was this regime which again brought back to the world the stoning of women , it is this regime which continues public hangings, it is this regime which hangs the juvenile criminals , it is this regime still at this time punishes the criminals by cutting their hands and feet's and removes their eyes, it is this regime that continues its discriminatory /biased policy towards the minority faith groups , it is this regime which continues its Islamic policy by not letting the Bahai's children to attend at schools in Iran or to practice their faiths at their holy places , it is this regime which detained leaders of the Bahai faith group, it is this regime which detains the civil rights lawyers and human rights defenders , it is this regime that won't allow its women to attend and watch sports games, it is this regime that calls women are half of the men , it is under this regime that women can't become judge and so so so many ……. Iranian people are tired of this Islamic regime and their Islamic policies. It is the Iranian people who are more modern , more educated and cultured and more civil than this regime and their officials…..
17 Years Have Passed Since The Killing Of Many Prominent Iranian By Agents Of The Ministry Of Information Known As Chain Murdering …. 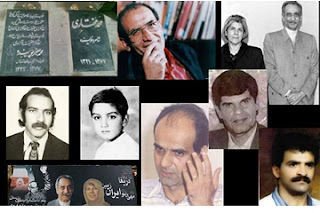 According to news , the families of those Prominent Iranian murdered 17 years ago by the agents of the ministry of information or the Islamic regime in Iran ( Known as The Chain Murdering) released a statement on this occasion. 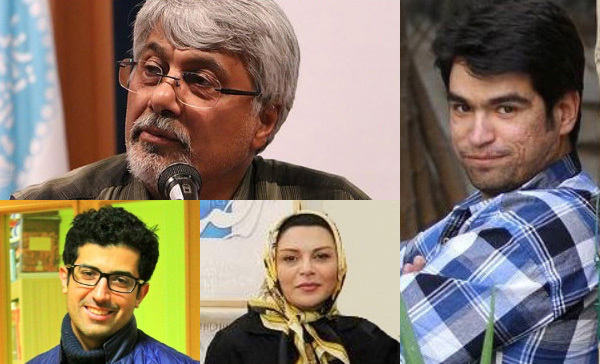 The families of Dariush & Parvaneh Frouhar ( Politician ) , Mohammad Mokhtari ( Writer ) , Mohammad Jafar Pouyandeh ( writer ), Majid Sharif ( writer-translator ) , Hamid Haji Zadeh ( Poet) and his son Karoon Hajizadeh and Pirooz Davani on commemorating their loved ones, released a statement . 17 years ago our loved ones were sentenced secretly and were kidnapped , their home were invaded, their body and soul were suffered and then savagely murdered . The autumn of that year is mixed with the blood of our dears. 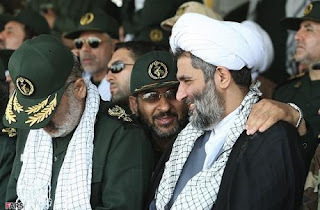 These murdering brought anger among the Iranian people all over the world. Despite of the evidence ,the justice was not served. On its 17th commemoration we want you all not to forget and help us bring the justice for those murdered and their families. I remember those days , day after day we heard the shocking news about a murder and few of us came together here in Toronto and hastily called a public meeting and showed our anger about these killings. 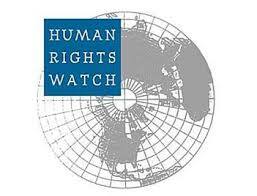 (New York, November 17, 2015) – The United Nations member countries should vote in favor of Resolution A/C.3/70/L.45 on the promotion and protection of human rights in Iran, Human Rights Watch said today in a joint letter signed by 36 human rights and other organizations. Citing continuing rights violations in the country, the resolution calls on the government of Iran to meet its domestic and international obligations. The vote is scheduled for November 19, 2015, during the 70th session of the United Nations General Assembly. Despite statements from officials in the Rouhani administration indicating that it would address some abuses, there have been no significant improvements in Iran’s human rights record during 2015. The judiciary has issued an alarming number of death sentences, with the authorities executing at least 830 people, including juvenile offenders, between January and November. Many of these executions were for nonviolent crimes for which international law clearly prohibits the death penalty, such as drug-related offenses. The government also routinely violates the rights to free expression, assembly, and religion. Security forces detain and hand out unfair sentences to journalists, writers, activists, and artists for peacefully expressing their views. The authorities have similarly detained and otherwise harassed groups such as teachers for peacefully organizing and advocating on behalf of their profession and their students. The authorities’ widespread discrimination against women in law and practice ranges from applying unequal personal status laws to barring women from public spaces such as sports stadiums. On A Raid In The City Of Ghazvin And Rasht 170 People Are Arrested By Sepah Intelligence …. 170 people are arrested by Sepah security forces in the city of Ghazvin and Gilan on November 7 and 10 , 2015 on allegedly website and mobile moral breaches. 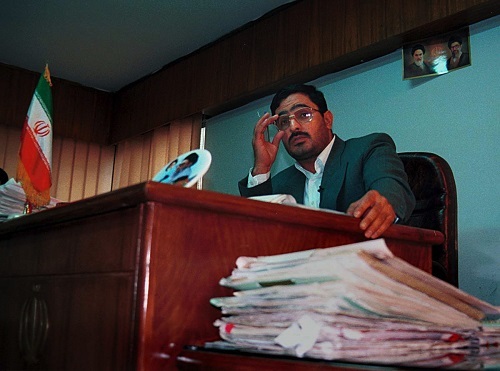 No one knows if there were a coordinated effort between judiciaries and Sepah agents or Sepah alone without any judiciary summons did all these raids. Sepah has its own prison ward in Evin prison known as " Bande Do Alef" and runs the show there. One day after these arrests in a press conference Mr. Mohseni Ejeie the spokesperson for judiciary rejected these arrests and said: ُWe have asked from prosecutors office in the city of Ghazvin about these arrests and they had no information about it . On Nov.10,2015 the Sepah online watchdogs in the city of Gilan also announced of the arrest of several citizens who have breached the cyber code of conduct of the Islamic regime. Iran- The New Wave Of Arrest and Imprisonment Of The Journalists Continues….. 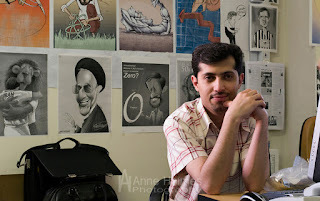 According to news , Hadi Heydari the Iranian Cartoonist and designer of the Shahrvand newspaper is arrested Yesterday (on Monday). 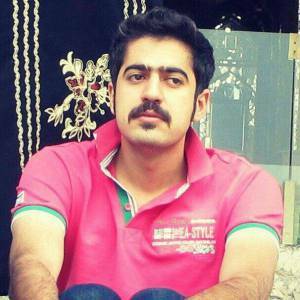 Two colleagues at Shahrvand told to ICHR that, on Monday a young security agent with a summon attended at the Shahrvand editorial and told Mr. Heydari to go with him quietly . No one knows the reason for his arrest . 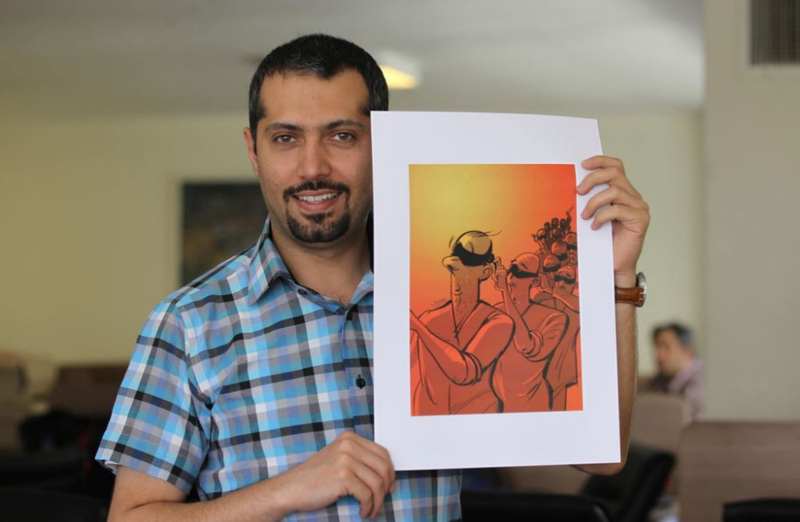 The last cartoon mr. Heydari draw was about the recent terrorists attack on Paris. Mr. Heydari is 38 years old and has more than 20 years work experience with the newspapers - particularly with major reformists newspaper. Mr. Heydari have been arrested and imprisoned for few times in the past . There are speculation that, Sepah Intelligence is behind his arrest and the rest of recent arrests . (London, November 13, 2015) – Pope Francis should press President Hassan Rouhani on the need to advance religious freedom in Iran, Human Rights Watch said today in a joint letter to Pope Francis from 10 civil society organizations from around the globe. President Rouhani will meet the Pope on November 14, 2015, at the Vatican as part of an official trip to Italy. Iran has a record of restricting religious freedom, and the pattern of religious discrimination has continued under the current Rouhani administration. The government denies freedom of religion to Baha’is, Iran’s largest non-Muslim religious minority, and has jailed and harassed Christian converts. Sunni Muslims in Iran face restrictions in political participation as well as limitations on constructing and operating their own mosques. The Iranian government has also discriminated against other religious minorities, including Iranian Jews, Zoroastrians, and Yarasans. Members of Iran’s Shia majority are not immune from repression. While members of the Sufi group, Nematollahi Gonabadis, consider themselves followers of Twelver Shia Islam, the official state religion in Iran, the Iranian government considers them members of a “deviant group,” and has increasingly harassed, arrested, and prosecuted them. The authorities have also imprisoned and otherwise persecuted dissident clerics for challenging the government’s official interpretation of Shia Islam. Suspicious Killing in Iran Continues………. 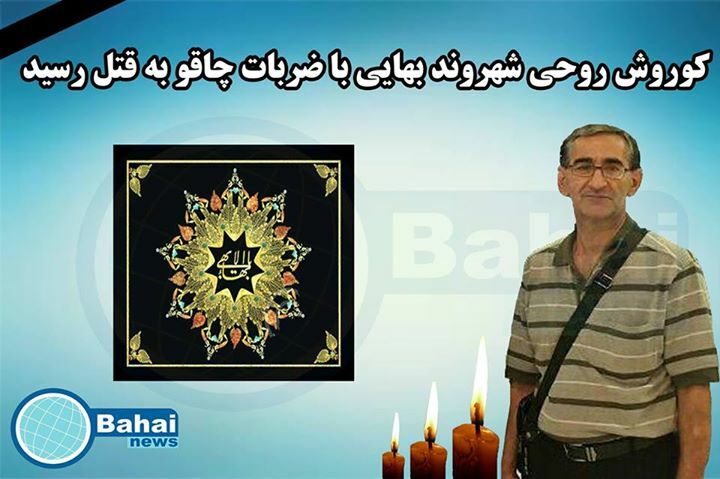 According to Bahai news Mr. Koroush Rohi a Bahai Iranian citizen was killed by knife yesterday in the city of Shiraz….. He was killed in the parking lot of his home at Fazilat St. in the city of Shiraz…. he was killed just on faith based belief …. Regime protects those who kills the Bahai's , supported by some radical grand Ayatollahs. Those who have killed would never face justice. Bahai News: 17 Iranian Bahai's Citizens Were Arrested On Sunday Morning ….. 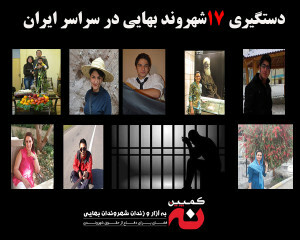 According to Bahai news ,17 Iranian Bahai's were arrested by security agents on the morning of Sunday at their homes. The arrest happened in the city of Mashhad , Tehran and Isfahan. According to news the security agents attended at their homes and workplace and after arresting them ,they have taken their personal belonging with them as well. All Dissent Iranian Lives in Iran are in great danger ………. Suspicious death of dissent Iranian are worrying those who follow the every day news in Iran. Time and time we hear person or persons with dissent voices have vanished or died suspiciously and there are no independent journalists or independent media to investigate on all those Iranian critical with regime policies or dissent voices died mysteriously in Iran. One of those who was suspiciously died is a Kurdish medical student with highest grade in his field . He was found death outside an unfinished building close to Loghman Hospital . Apparently as the news indicated , he was pushed off from the sixth floor of that building . The news added that it is possible several people pushed him down from the floor. 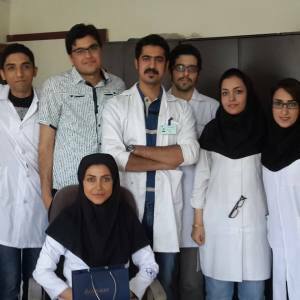 Doctor Ehsan Karimi was in his last year as intern from Beheshti Medical School. The media in Iran reported the death as suspicious. 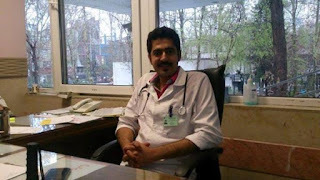 Aftab News wrote: This medical student was a top IQ medical student and he had No mental or drug addiction. 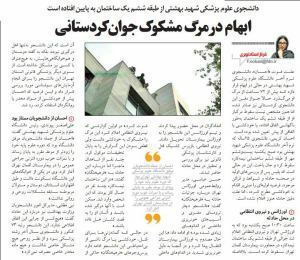 Farhikhtegan newspaper wrote: There is speculation that probably he was pushed by several person from the sixth floor of the building. 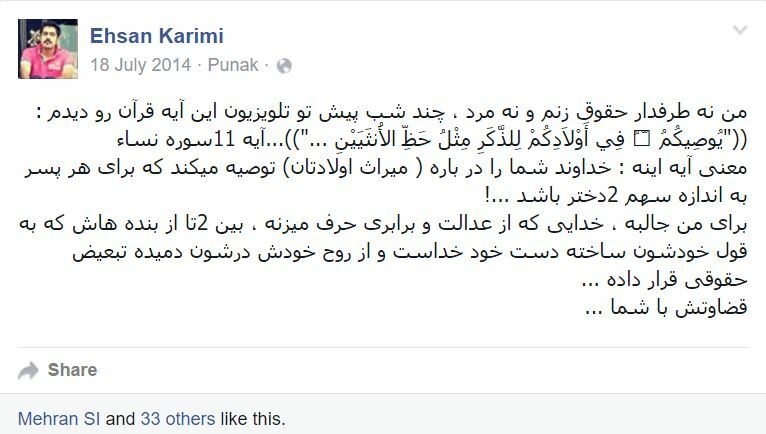 And this link shows doctor Karimi's comment which probably angered the hard line regime killers backed by hard line ayatollah namely Ayatollah Mohammad Taghi Mesbah Yazdi and……. 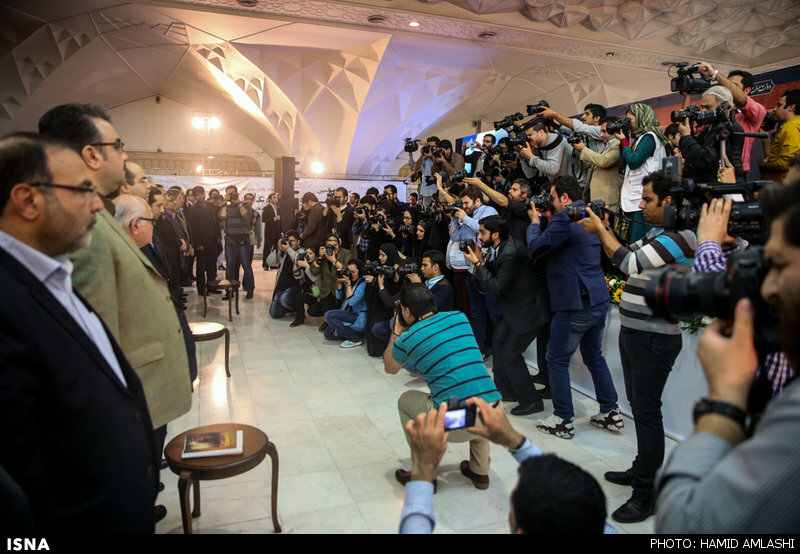 Regime's Seven Days Media Exhibition And The Imprisoned Journalists in Iran…. 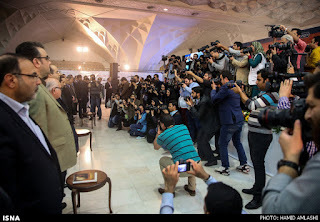 Every year Islamic regime runs a show and it is called as "The Media Exhibition" . Islamic regime has many shows like these in Iran…. First of all media are not free in Iran. secondly, the real show is in fact in the Evin and other prisons where the journalists are kept. regime imprison journalists to silence / to muzzle them . 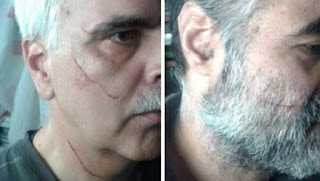 Attacks on journalists and their family members are constant in Iran………. Journalism Is Not A Crime ! Islamic Regime In Iran Violates All Protocol By Re-Arresting The Former Political Prisoners On Baseless Charges ….. According to a report by HRANA, Ms. Fatemeh Mosana a political prisoner of the early years after the revolution is arrested again by the security forces . Ms. Mosana was arrested last October according to HRANA reported . She was just 13 when arrested together with her mom and three sisters and spent 3 years in prison. She was also arrested together with her husband Mr. Hassan Sadeghi at the end of January three years ago and were released one year later . According to Iran Kurdistan Human Rights Organization, Mr. Ali Hossein Panahi a teacher is sentenced by Sanandaj city Court of revolution to six years imprisonment allegedly on charges that he has insulted the leader of the Islamic regime in Iran. According to the same report, this imprisoned teacher have spoked in the city of Dehglan and then in a mosque in Ghorochay village against the regime officials and by asking the people not to keep silence against regime's discrimination. It was after these speeches ,the security agents attended in his family home in last september and arrested him. It was said that, this teacher was fired from teaching by an order from intelligence agents after eight years teaching in Dehgalan and sanandaj city schools. GENEVA (11 November 2015) – The authorities in Iran should stop arresting, prosecuting and harassing journalists and online activists, and provide a safe space for freedom of expression as the country prepares for parliamentary elections early next year, UN human rights experts said today. “Increasing intimidation of journalists is hindering their ability to operate freely in the country,” said Ahmed Shaheed, UN Special Rapporteur on Iran. He noted that in recent days, Iranian intelligence and security officials have arrested a number of journalists in what appeared to be a new crackdown on freedom of expression and the media. The arrest on 2 November of five journalists, including Afarine Chitsaz, Ehssan Mazandarani, Saman Safarzai, and Issa Saharkhiz, by plainclothes members of the Revolutionary Guard’s intelligence units was particularly worrying, Mr. Shaheed said. The journalists were reportedly detained on suspicion of taking part in an infiltration network, seeking to influence public opinion and undermine the Islamic Republic on behalf of western governments, according to Iranian state television and media reports. More than a dozen other journalists and social media activists have also reportedly been summoned for interrogation by the authorities. 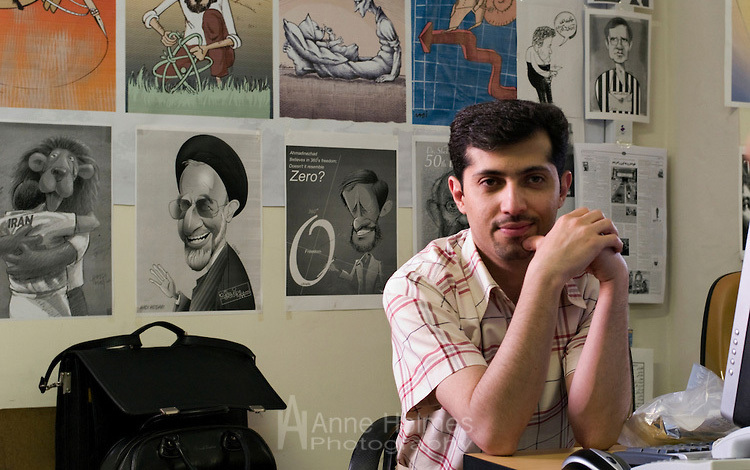 Iran has one of the highest numbers of journalists and social activists in detention in the world. According to figures from April 2015, at least 45 were being held for their peaceful activities. “The government of Iran should not silence critical or dissenting voices under the guise of vague and unsubstantiated national security concerns,” Mr. Shaheed said. As a State party to the International Covenant on Civil and Political Rights, Iran has international obligations to allow and protect the right to a free press and access to information, he stressed. “Freedom of expression is central to guarantee open, free and fair political processes. Ultimately, democratic processes are unsustainable if media workers and activists have no safety to perform their vital role,” said David Kaye, the Special Rapporteur on the right to freedom of opinion and expression. The timing of an increase in detention and harassment of journalists was particularly worrying, Mr Kaye said, as the country prepares for parliamentary elections in February 2016. “Public participation in any electoral process is virtually impossible if the media and civil society are so frequently affected by arrests and prosecution. Unfortunately this is not a new concern; similar concerns were expressed by UN experts regarding the arrest of journalists just before the Iranian elections of 2013” said Mr. Kaye. The Iranian authorities should reverse this trend and must quickly ensure “a greater space for free exchange of ideas in the run-up to elections,” he added. The human rights experts urged the Government of Iran to release all journalists including Jason Rezaian, who have been arbitrarily and unlawfully arrested for their peaceful exercise of fundamental rights. “The Saudi Arabian authorities appear intent on continuing a bloody execution spree which has seen at least 151 people put to death so far this year - an average of one person every two days,” said James Lynch, Deputy Director at Amnesty International’s Middle East and North Africa Programme.